Update 2: This article is also available on the Adobe Developer Connection. The article is edited and therefore a better version of what you read here. Of course you are welcome to continue reading this page, result is the same! Update 1: We are working with the patched version of Fireworks CS4 for a few weeks now and most of the problems are fixed. I removed the negative comments in this article on the bugs in CS4. So, you are a designer. 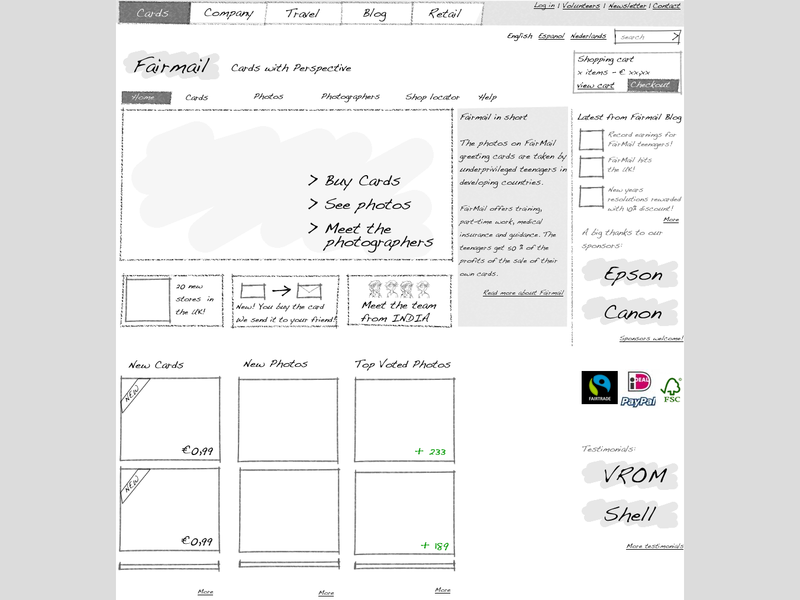 A concept-, interaction- or visual designer and you use Adobe Fireworks for sketching, wireframing, visual design and of course prototyping. Great choice. I have been working with this program for many years. I think it is the most efficient tool for creating anything based on pixels and consisting of more than one screen. In this post I use Fireworks CS3, but you won’t have any problems creating something simular using CS4. Lately we are working on quite some iPhone applications. We always aim to see the design we make on the device it is made for as soon as possible. For web design this is easy. Use the “preview in browser” function in FW. But for iPhone it is a bit harder. We created 320*480 png’s and synced these “photos” with the iPhone so we could get a bit of a feel of how it looks on the handheld. But we wanted more. Click through the screens the way you normally do with a FW mock up. Make use of the full screen (no Safari buttons). Export directly from Fireworks without the need of changing CSS or HTML afterward. Opening the app from the home screen. Be able to send links to every iphone without even be an official iPhone developer. Learn Objective C or depend on someone who can. Take many actions before you can actually see the screens on the device. Wait for a new screen to load every time you click a button. Animations, within a screen or from screen to screen. Using real form elements (that trigger the default iPhone UI elements). This demo is made in Fireworks, with the help of PHP and jQuery. We tried using Axure, IUI and webapps.net as well, but did not succeed this far creating something that was really easy to make. Download this zip file containing some folders with PHP files and jQuery. Create the screens with FW like you normally do. Start with a 320*480 canvas and call the first page “index” (no capitals please!). 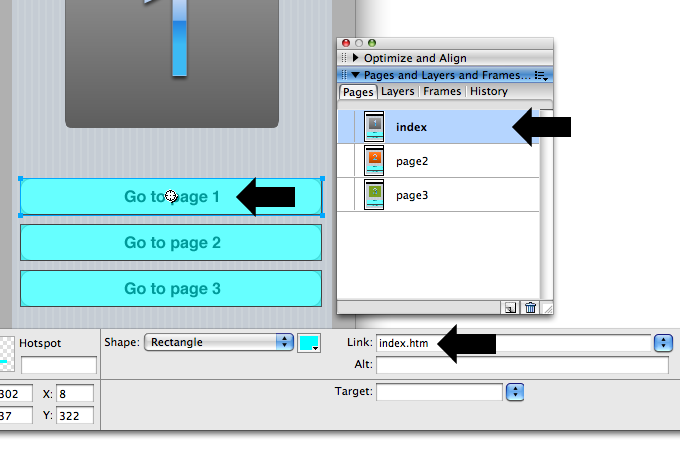 Use hotspots (instead of slices) for creating links to the different pages. Export the mockup to HTML and images like you normally do to test the mockup in a browser. Upload everything to a server that can execute PHP. Get your iphone and visit http://www.yourwebsite.com/..path..to..iprototype/iprototype. When you open the URL on the iphone, jQuery will check the height of the screen, so it knows if you already have added the link to your homescreen. If you enter the site from the homescreen, the height of your window is 480px. So jQuery gets the content of the mockup using PHP. All .lbi files are loaded and changed a bit by PHP to correct path to images, remove unnecessary tags and change the links so jQuery can work with it. Also some DIV tags are wrapped around the images and the ID attribute is set to the name of the file. jQuery hides all DIV’s found in the generated HTML, but makes the screen (page) named “index” visible. Clicking the image maps (hotspots) on this image shows the DIV the URL links to. The folder “includes”: A folder with some files needed for the prototype to work. functions.php: A file to read and modify the exported files from Fireworks. If you are new to Fireworks, there are many tutorials to be found on the web. I won’t go into detail about how to use the program, but will point out a few important things for making prototyping for the iPhone work. A great way to start is getting the iPhone UI elements from Metaspark (thanks for this guys!). Open Fireworks and create a new file setting the canvas to 320 by 480 pixels and name the first page “index”. This is important because otherwise you’ll get a black screen opening the first page on your iPhone. Fireworks makes use of pages. Every page can have its own graphics, buttons and settings. To be able to click through the screen, you need more than one page and link these pages together using hot-spots. This easiest way to create a hot-spot is to right click the element you want to be a button and select “insert hot-spot”. In the properties panel you enter the page name you want the button to link to. You can enter this manually or use the pull-down menu. If you create a link to a page that does not exist, you will see a black (or whatever background color you set) screen and you’ll have to reload the prototype. Make sure all links are correct. You can export the prototype as “HTML and images” to check everything in your favorite browser. Click “file>export” in Fireworks. Find the “Library” folder. 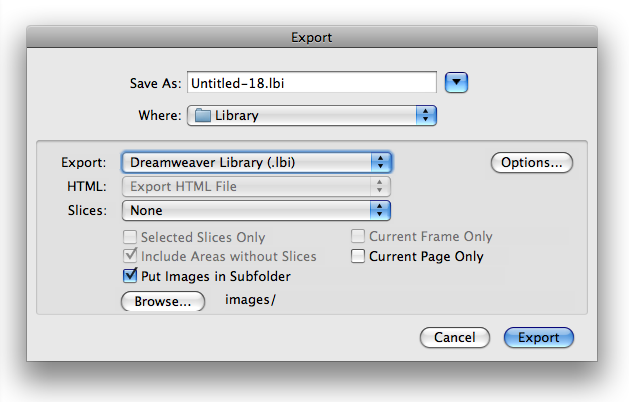 Export the file as Dreamweaver Library Items. Dreamweaver library items are small pieces of HTML code that you normally insert into webpages and will update automatically, but forget about that. Other settings: Don’t bother entering a “file name” as the files will be named after your pages, “Slices: None”, Check “Put images in subfolder (images)”, uncheck “Current frame only”. Hit “Export”. All files in the iPrototype folder should be on a server that can execute PHP. I normally use FTP in Dreamweaver to do this. Take your iPhone and navigate to the address, ending with /iprototype. Follow the instructions on the screen. Let us know! We can also create a prototype for you, or help out with the design, that is what we do! Really neat. I was able to get this working with CS but I had to hand code the link to the image map and also export the pages as png’s. Wow! Matthijs – Nice job on the video demo and tons of content to clearly explain how to set this up. Thank you! this is awesome – thank you so much! awesome, thanks so much for this. Is there any way to link to an mp3 file on this and get the phone to play on the mockups? or does the conversion when in firefox make the link unusable? @tim I have tried to make buttons in the prototype to call numbers and show directions in Google maps. The problem is that every external link will not work as expected in a full screen webapp. I did not try to play MP3’s, I might take a look at it in the next few days. Hi guys – first of all: Great post! I’ve followed the instructions and created some screens in FW CS3, fired it up on my webserver and everything worked fine on my iPhone 3G (Safari). So I created much more screens (about 50(!)) and linked all of them to each other. Suddenly I experienced some trouble (look to my screenshot here: http://yfrog.com/11iprototypeimageissuej). Only sometimes (and randomly on different screens) Safari shows a questionmark cube icon (instead of displaying the image). Nevertheless the hotspots are there (there is no image, but the spots are clickable). This problem occurs on all connections: Wi-Fi, 3G and EDGE (I also tried out running a local webserver through lighttpd on the iPhone to avoid potential loading issues – but same problems here). Especially the fact that this error happens randomly on different pages (images) bothers me. Sometimes it works perfectly through all screens and sometimes it just comes again so I’ll have to press Home and restart it from my Homescreen. The Links are all correct, also testing it on different Browsers (Firefox3 & IE7) makes no problems. I also talked to Matthijs (thanks for the quick response!) and it seems to be an issue with too many pages / Safari not loading all of them correctly. But as I mentioned: Sometimes it works on Screen X, sometimes not – regardless of the available internet connection (also on localhost). Someone an idea how to fix this? Thanks for your feedback (http://blog.protoshare.com/2009/06/17/native-iphone-prototypes-with-protoshare/) regarding iPhone prototyping with our new proof-of-concept! You are right, being able to view the prototype directly in the device makes for a better application. This is why learning what you and other iPhone application developers need is so important as we develop this tool. We have built ProtoShare on the foundation of team collaboration within the prototype and for people who may not have programming knowledge, so we hope to be able to bring these features to iPhone app development. Great tool and resources – thanks for sharing, you’ve saved me a bucket-load of effort. Have just developed an iPhone prototype following your instructions. *Note – I had to export each frame individually from Fireworks CS3. @Ian, why do you need frames? Use pages instead, you can export the whole prototype at once. @Matthijs, you’re absolutely right – I don’t use FW often so thanks for pointing that out. Having trouble working with pages that would require scrolling. Should pages longer than 480 work? I see that it does a check for height=480 on the index page but was hoping interior pages could be longer. Cliff. Yes, you can make pages scroll. Open the index.htm file and look for the CSS. Hi Mattjijs, Great idea and demo. 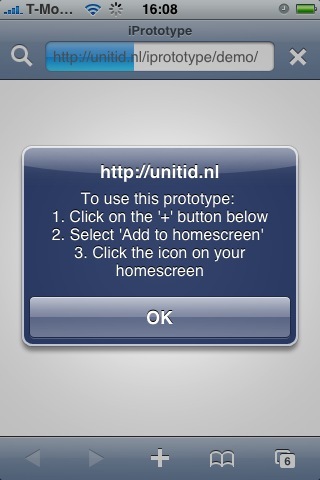 I tested your demo of your iprototype at ‘http://unitid.nl/iprototype/demo/index.html’. It worked fine. Could you please tell me solutions? Because I am not familiar with php and jQuery, I don’t know which parts I should fix.. Thanks. Love this. Can I scroll the page without having the botton iphone nav bar scroll? Is there an easy way to only scroll search results and not the bottom bar? unfamiliar with FW, your great explanations and video made it easy to understand. I will try this in my next project! Is there a way this can be done with Photoshop? I don’t work in Fireworks and don’t want to either. How can I insert a ‘back’ button as hotspot? This approach for a GUI mockup is great thanks to the ‘real’ behavior! Is there a way to insert a hotspot which acts like a ‘back’ button? I do not want to link it to a specific page; I want to return to the ‘previous’ page. Hello and thanks for the great work! I tried to include something with as I edited the lib file but it doesn’t seem to work. Any ideas how I could include a google maps or youtube link? I wanted to say I included something using iframe.. Thanks. This seems to be a great tool. As a beginner, I have couple of quick questions. When does the prototype brake after the initial 30 pages and why? Is “many more” reffering to 40, 50 or more then that? I haven’t worked with Fireworks before so bare with me for a stupid one: Do I have to have one page/each state (or screen) shown? Is it possible to asign states to buttons e.g. on/off button instead of creating separate page for every state? would it be possible to add ‘swipe’ gestures? “-webkit-tap-highlight-color: rgba(0,0,0,0);” to the CSS to hide the grey box when tapping buttons. I was designing for iPad and managed to adapt iPrototype for it. It should work for both orientation. i rebuilt the site in FW now. and uploaded the whole thing. the problem is when i add the icon to home screen, and then click it it directs me to where the app sould be but then dislays that inmage with ‘to use this prototype’ when i ignore that one it gives me a black screen..
when i view my app in my chrome browser it works perfectly. but on the iphone it keeps displaying that ‘+’ message and then turn black..
i found out is’t a problem with the new OS 4 for the iphone…. on 3 it works fine but on 4 problems as previously mentioned occur! I have tried your Demo, well done! But it doesnt work on 3g only on wifi. Does this prototype only works with wifi? I have been doing it with fireworks/dreamworks(asp) before. The only thing, however, that I’m struggling with is not necessarily how to put images on iPhone but to include transition into my prototype. Since different transition/animation on iPhone communicate a lot of important messages to the users, I find it hard to present the prototype without transitions. I have been experimenting with HTML5/CSS3 transition but they are very slow on safari mobile. If you can find a way to include the basic iPhone transition, that’d be awesome. (Some page sliding left/right/up/down, fade in/fade out, etc)! 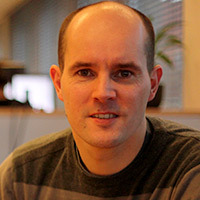 @Vincent We already have this running within our company, we will publish the new method soon, let you know! The future features sound interesting, when do you plan to release? Hi, great article! I want to set up this prototyping process but first I’d like to know if it works with Fireworks CS5 ? Thanks! Can’t wait to see the new version with transion! I assume you’ll be using the nice animations that some might know from jQTouch? Another great improvement would be the use of local storage method, so that you don’t need to download your prototype from your server every time. Thanks for your great work! BTW, we do support the usage of form structures and animations in your prototypes! Great tutorial. Thoug it seems I’m pretty stupid. The part that you’r doing in dreamweaver. Where does the exported files from fireworks go when your pushing the blue arrow in Dreamweaver? How to set up a server like that? Do i need to by a web hotel? @Maestro, you need a server that executes PHP. Can also be a local host. For using dreamweaver, there are lots of tutorials around. This is really great, thank you thank you! I do have one little problem though that I’m hoping you can assist with – part of my prototype is simulating a list of rows that when you click on go to external websites… I had hyperlinked these with image maps in Fireworks but when I put it up on the server it just goes to a blank page. I’m guessing it’s to do with the “#Remove .htm extensions” in the functions.php file, but I’m not sure. I’m not all that familiar with PHP, can you provide some direction? Excellent article and I have now built something, I have exported to dreamweaver but do not know how to upload this, I have a domian and server access, could you help. Please!!!! I have now uploaded and can get to the stage where I select my prototype, at this point I have a white screen, my index file is still call index no capital and yet still this persists. Thanks for a brilliant tool. Got this working fine commented out the height as I want my pages to scroll. I also commented out the jquery.js file as i found that It pushes the image under my phones status bar and I want the prototype to feel like it’s in a browser is there a way that I can get the browser chrome back?